and the "you have been accepted into the mechanical engineering department for fall 2012" letter he just got. So proud of that boy! We picked David up from school to take him out for his birthday lunch. For some reason (maybe because he is the fourth birthday this year? ), he was expecting it. We took him through the Mexican fast food drive-up, he placed his order, and the girl tallied it up. "That's funny!" she said through the crackly speaker. Dave and I looked at each other blankly, but pulled forward anyway. At the window, she slid open the glass, held out her hand, and repeated the amount owed. "That's funny" sounds an awful lot like "Three twenty," don't ya know? We got a kick out of it. David loves green, so that's what we had for dinner. Green Koolaid in washed-out soda bottles, green grapes, (white) chocolate melted over pretzels and popcorn with green sprinkles. Grilled cheese and green onion sandwiches, cream of broccoli soup with more green onions - and wear your best green shirt, of course! 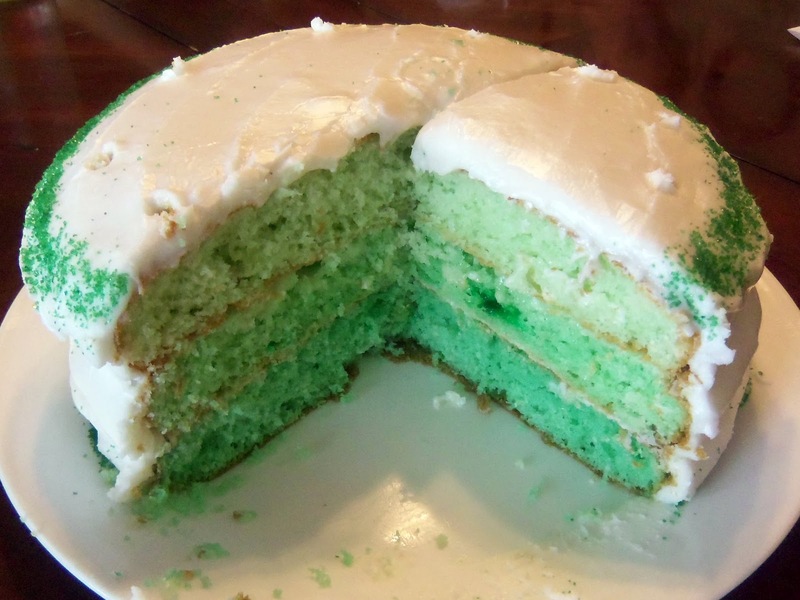 And the cake was green. I had fun trying to make the layers different shades of green, (hard to see, because my cake-making is admittedly better than my photography). 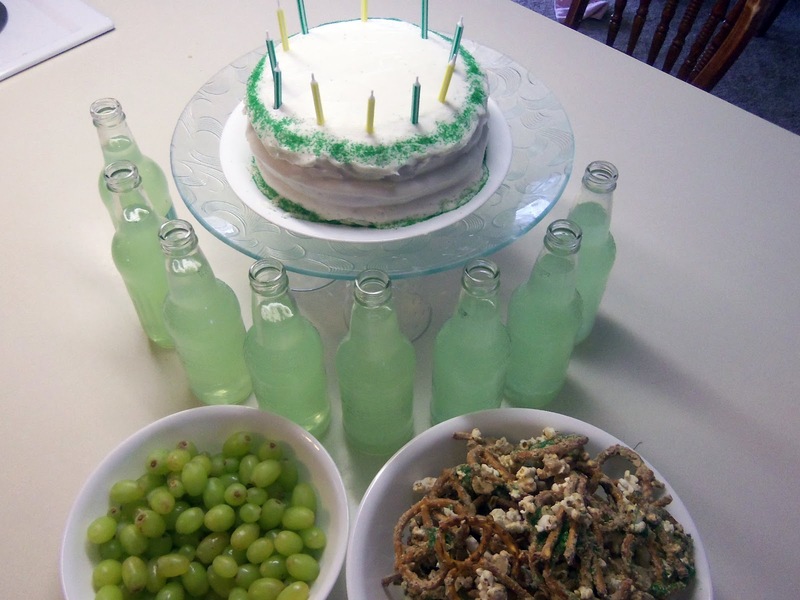 The family favorites were the pretzel/popcorn/sprinkles mix, and the green drinks. Trent thought we might need to pour the Koolaid into glasses, but they loved drinking out of the bottles! The boys experimented with different hand positions, trying to figure out what was the best way to grip the bottle. Grip the neck, or put the pinky out? They were fun to watch! What a fun boy our David is! I love his reckless grin, his quiet thoughtfulness, and his tender caring for someone who is hurt. Playing rough and wild is his style, and he makes up fun games for his sister and the twins. David is bright, and I have enjoyed watching him excel in his gifted class this year. 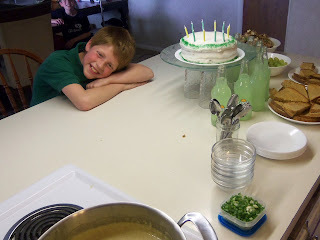 Happy birthday, David - I'm so glad you're in our family! 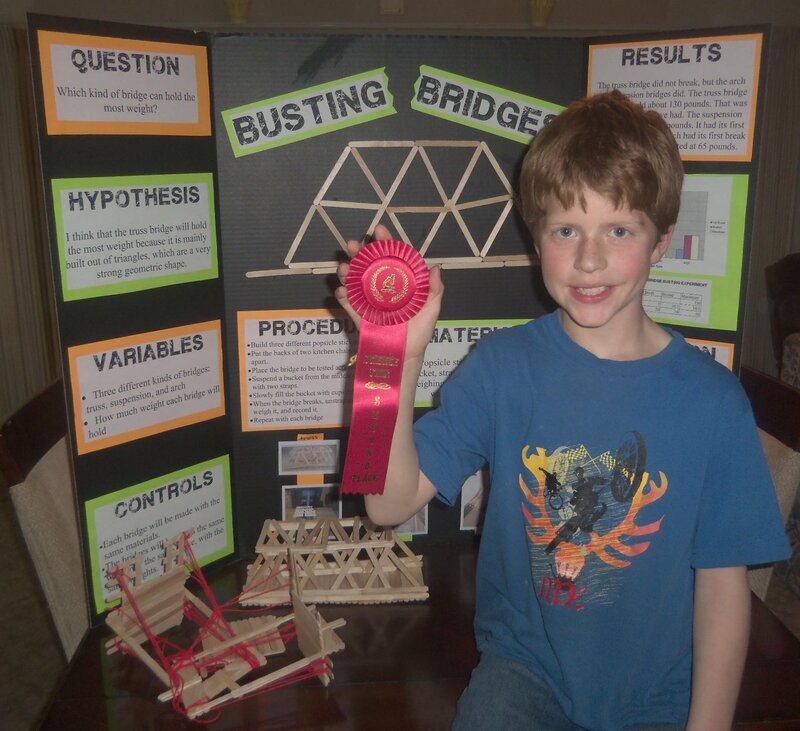 The birthday boy, with his second-place science fair project. Way to go! David came up to me, not an hour an a half ago, while we were in the middle of gathering everyone for prayers. He held out a paper and quietly said, "I just found this in my backpack, so... ummm...?" The paper was a note from his teacher, telling parents (who were supposed to sign and return it) about a four-week course of study about genetics and inherited traits. Evidently, David was supposed to do a science-fair-type project, complete with display board and oral presentation. And it is due... TOMORROW. Feeling small but growing amounts of frustration here. It's Emergency Homework time. Emergency Homework means that while Mom will help you, she is not happy about it. We do the basic amount necessary, with no bells or frills. It will be neat, but not nice. And Emergency Homework means that you are in big trouble, Buddy. We have worked on it ever since - him working frantically, me guiding. And now I want to go to bed. We have a poster to put together in the morning. Argh. Edited to add: We did it - here is the completed poster. I am going back to bed. Or at least I wish I were. David and Eddie don't go to our neighborhood school. Sometimes (often?) I wish they did. I would love to be able to look at the clock, panic about the time, shoo the boys out the door, and sit down with my bon bons and soap opera. OK, so I haven't watched a soap opera since high school, and I've only once had bon bons, because Trent heard me saying something about bon bons and soap operas. Instead, these two boys go to an elementary school across town. I really shouldn't complain about it, because it has a specialty program that works so well for David. I've been very impressed with how much better he's done in his schoolwork since starting this program last fall. But I am not fond of the drive. I am glad that we found another family to carpool with, so I only have to drive half as much. See how much I have to be thankful for? And how I gripe! It is my turn to drive this week, both ways. This afternoon, I TOTALLY spaced it. I wasn't thinking of getting the kids at all! I was sitting in the hallway, holding on to the doorknob of the babies' room, preventing them from getting out. Hmmm... that might not sound good. But they were supposed to be taking a nap and they kept coming out. After about 45 minutes of seeing drowsy but mischievous babies wandering down the hall, I decided to take measures. It was boring, just sitting there, so I pulled out the laptop. I'll admit, (hanging head sheepishly and drawing circles on the floor with my toes) I was on Pinterest. And I lost track of time. Shame on me. I'm not ashamed of being on Pinterest. It's a great way to share ideas, and I've used a bunch of them in my home. I am ashamed of forgetting my kids. I hate it when I do that. Good thing the kids are so easygoing... I just hope the other mom is too! The ants from here, here, and here finally went away. I do not know why. They just did. Maybe they died of boredom. Maybe it got warm enough outside to go live there. Maybe they were afraid of what super power I was going to pull out next to use on them. Maybe our odd antics scared them. I suppose that in the end I don't care why they left. They are gone, and I am happy. And the Angel can go into the bathroom again without fear of being eaten. That's always a good thing. We've (I've) been working on spiffing up our house. We moved in a while ago, but since then we've had a pregnancy, bedrest, twin babies, Angel's accident, twin toddlers, a couple of floods, teenagers... and they all want dinner. Every day. The nerve! So we haven't finished moving in. Most of our walls are bare. 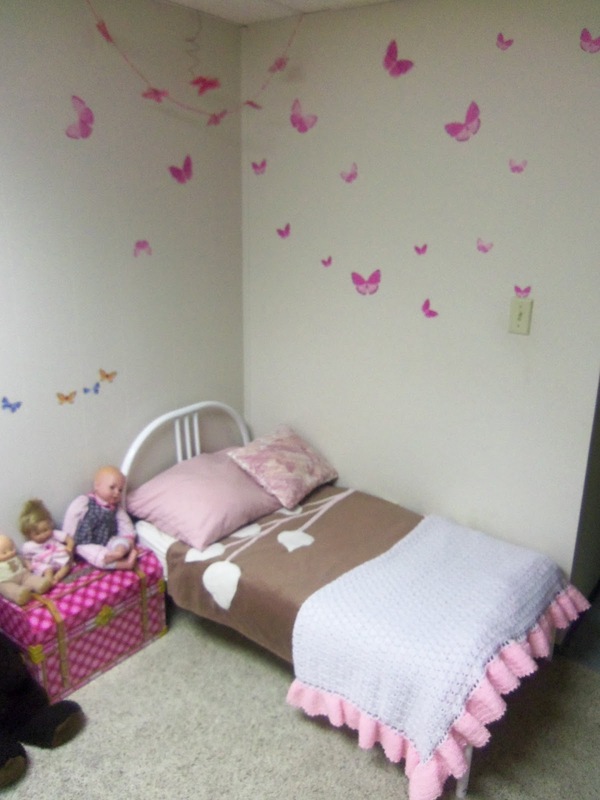 We could use some decorating and pretty-ing (although we can't actually pretty with boys, can we?). I'm working on it, and actually enjoying myself. There isn't much time in a day that I can do what I want to, but I can sneak in a bit here or there. It's like playing Tetris with your time, while working around moving minefields. What an adventure. Anywho, Angel's bedroom looks pretty sweet. I showed you her bed back with the other beds here, but here it is again. 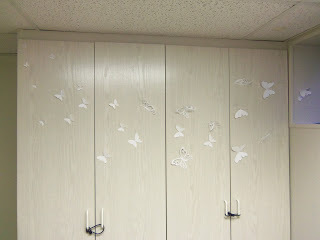 And here is her wall of butterflies. Paper butterflies from Clair's mommy's Silhouette - wings folded up along the body line and stuck on with gooey stuff on the body so the wings stick out, closet doors tied shut because MY craft stuff is in there! And that is why I put them there. Yeah, I know. Not really a surprise. But I thought I'd out with it just because. Some of you who are starting to come and poke around in my rambling writing actually know me. Like my mom. And it's better to be honest anyway. 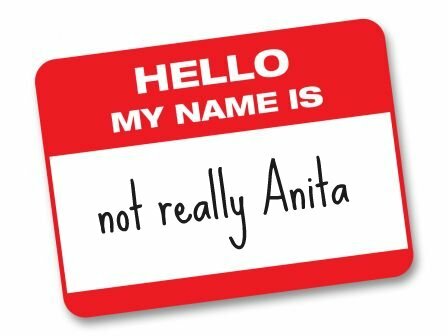 My name isn't really Anita, and my kids really have different names, too. For reals. Don't think that you are going to be getting the whole truth, however; I have a little bit of a thing for privacy - especially where my children are concerned. All you need to know is that I do have a real name, and it's a nice one. Anita is a nice name, too, but it's my psuedonym. I always wanted to have one, anyway. And other than that little deception, all the other stuff I write about here is true. Oh, you probably won't believe that, either. The things that go on are pretty wild around here sometimes. But I m not making this up - my imagination isn't that interesting. Really. 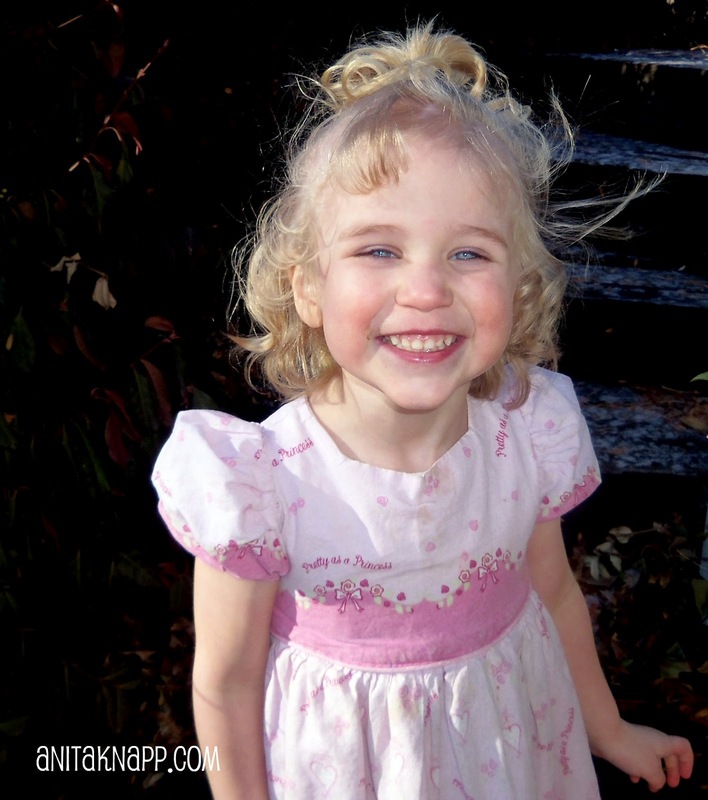 A year and a half ago, our little Angel thought her wings were grown. At a few days past her second birthday, she tried to fly out of our back window. She landed - on the left side of her head - onto the cement patio two stories below. The end result was an awful traumatic brain injury, several hospital stays, a synthetic skull, and a strengthening of my faith. I look at her now and am absolutely amazed. I spent some time last night, re-reading the blog I wrote about the ordeal. I have a hard time believing it was all real. And I have a hard time believing that what she is now is real. Her fall changed our lives, suddenly, permanently. I hope I never again take my child's breathing for granted. Every day is a bit more precious, and more worthy of thankfulness. <sigh> I really hope I never have to do it again. I hope you don't either. It was horrible. And it was amazing, to see the string of miracles that happened. You can run over to AngelAngelee if you want the whole story. I'm ever so glad I wrote it down, and I'm ever so glad I still have my little Angel. Thanks, Lord. Alec was planning on working this fall. 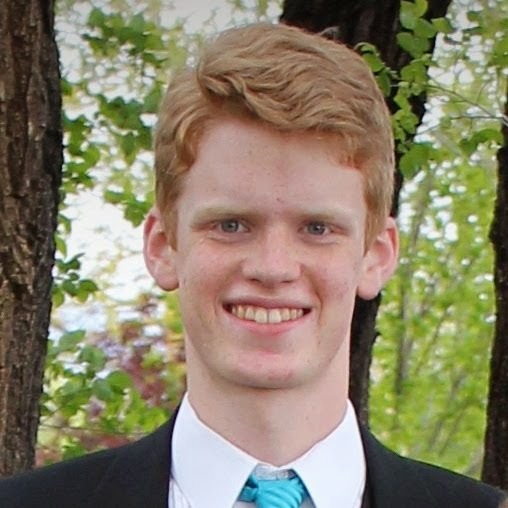 Despite his high school graduation next month, and university graduation in a few weeks where he will earn his Associate's Degree, he didn't really feel the need to move away to college just yet. Strike that. He desperately wants to move away. I was like that at Eighteen, too. But I think the huge financial requirement of full-time college is weighing pretty heavily on him. His plan was to work for a while, sock away some money, and then college. He wants to be an engineer, smart boy. I was smart at Eighteen, too. Over the weekend, his plans abruptly changed when, as a result of his gold medal (gold medal!) in the Science Olympiad, he won a decent little scholarship. Today, we visited the campus and talked with the engineering advisors. He's pretty stoked. I loved seeing his excitement, his enthusiasm, and his nervousness. I was like that at Eighteen, too. In the middle of my reminiscing and nostalgia, I realized that I was entering a new phase in life. I'm going to start losing children. My family will be shrinking instead of growing. I've known this was coming, of course, but I wasn't planning on it coming up so quickly. My own age is slapping me in the face when I try to feel like Eighteen. What happened to the youthful, energetic, talented, smart, I-can-do-anything me? I think my mom felt like that when I was Eighteen, too. My name is Anita and I have a thyroid problem. (in chorus: hi, Anita) You, too? I don't know how I could avoid it - my Mum and Dad both have thyroid issues. Maybe it has something to do with that Downwinders Club the government signed them up for when they were kids. Or maybe it's genetic. Who knows? All I know is that they have it, I do, one of my brothers, a few of my brothers' wives, and my mother-in-law all do too. We deal with it. 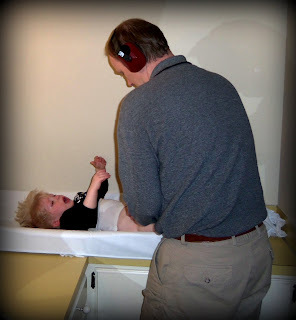 I was first diagnosed about 13 years ago when I went in for a checkup after I weaned baby Chris. I had been feeling weird: aching joints, dry skin, always cold, and tired. Oh, I was so tired. It was bad enough that, as I laid on the couch all day, I wondered if I was pregnant (fatigue is always one of my first clues). It wasn't pregnancy, but my thyroid starting to die. Now you know where that tricky little gland is! It was producing less of the hormones it is supposed to make, which made my body go all wonky. I never realized how many things were affected by this little, previously-unappreciated gland. I got checked, started taking synthetic thyroid hormone, and started feeling better again. I did have a little nervous breakdown thinking my body was beginning to fall apart, and discouraged about having to take medications for the rest of my whole life. But as I was feeling more like myself, and less like a cold, exhausted blob, I was ok with the plan. It's amazing how our bodies are so complicatedly interconnected. Everything affects everything else, and it all has to work together well for us to be healthy. God is a master designer, and I'm so grateful. I've had some ups and downs as my thyroid puts out more, then less, then even less of the hormones it was built to make. I a pretty goo at recognizing the signs of an off-balance condition now. Last week, I went to refill my prescription, and found out that I was out of refills. It took a week to get a doctor's appointment, a blood test, and a new prescription for another year. I've been feeling a little bit slow, and chilly, but I'm thinking I should be back to normal (whatever that is) soon. The biggest thing it makes me realize is this: there are so many things that could go wrong... which usually don't. Wow. We are often late to church. Sunday mornings are just a riot, you know? We all play a little harder on Saturday than we are used to, because we can. And then we try to sleep in on Sunday morning, because we need to, or because we feel like we are entitled to it. We lounge around a teeny bit, and then, all of the sudden, it's run and hurry time! Where is my tie? I have a black sock and a blue one. I can't find my dress shoes. No, those dark pants show all those smudges really well. Your shirt is so wrinkly! Did you wad it up in your drawer for a week? There's an awful lot of "I can't find" going on. It makes me crazy. And I'm hurrying too, because I actually want to put on makeup and nylons, and do something cute with the Angel's hair. Cah-razy. I wish I had known about the Sunday Man. He is a good friend of ours these days, and lives on the floors of the boys' rooms on Saturday afternoon. The kids, as part of their Saturday chores, have to round up their Sunday clothes and lay them out for the next day. It is so much easier to get dressed when you have all of your clothes ready and waiting. And it gives Mom a chance to edit and veto as necessary, or to run a quick load of laundry. The boys really get a kick out of arranging the Sunday Man on the floor, with the shirt above the pants, and the socks and shoes on his "feet." He looks like Flat Stanley lying there, just without a head. They like to arrange him in different poses, or holding things. I'd post pictures if I could find my camera (it was stolen by babies). Now, if we could only do something about that feeling like we can sleep in, we might be on time more often. One step at a time, I guess. Congratulations to Alec! He just called from the university where his high school is competing in the Science Olympiad. He's been working hard, for the third year in a row, on building and flying rubber-band powered helicopters, answering all kinds of physics questions, and building mechanical robot arms.. I couldn't hear him very well for all the squealing and cheers, but there was something about "took first place in the state," and "going to nationals," and "Orlando." I love seeing my children involved where they can really excel. It makes it even more worthwhile when others realize how great my kids are. <smile> But the best part, at the end of the brief phone call, was when he said, "I love you, Mom." I don't get that very often from my teenagers. That makes it all the sweeter. I love you too, buddy. And how are you getting to Florida? I guess Freddie was a little bit hungry this evening. I was helping David finish up the school project he has been working on this week (bad words for teachers who give lots of homework over spring break), and Trent was wrangling the little ones. I heard cupboards and small clankings in the kitchen, but thought it was just Ben, getting himself a snack. It wasn't. Freddie had climbed up onto the counter, opened the spice cupboard, and was busily pouring. When I got to him, he had already dumped about a cup of sugar on the counter, and was mixing in a bottle of Cajun spices. Red-hot sugar, anyone? I wasn't able to extricate him from the mess and clean him up before he put his fingers in his mouth. Yowza! Maybe he'll think twice about trying that particular stunt again. No, he'll find another one. I went to a funeral today (I've always wondered why the word funeral starts with f-u-n...). My attendance was required, even though the dearly departed was not a direct relative of mine. I was asked to accompany a musical number. When the music was dropped off at my house a few days ago, I was astonished at how many notes there were on each page. And how many notes there were in each measure. 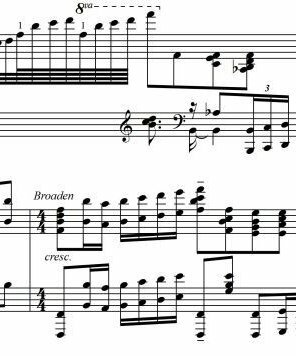 Ummm... sixteenth notes in most measures? 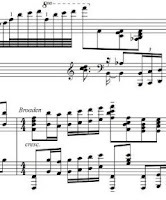 And thirty-secondth notes? I was hyperventilating a little tiny bit. The boys wondered why they hadn't given me more time to practice. Funerals are usually short-notice gatherings, my dears. I practiced and practiced. Most of the time it was a four-handed duet. Or a six- or eight-handed number. I get lots of help in the music department. When I got together with the vocal soloist, I was impressed again at what a beautiful, clear voice she has. And I was depressed with how badly I still couldn't play the music. I went home and practiced more. In desperation I begged Trent for some white-out. Then I went through the song and took out all the extra notes. There were sure a lot of notes that didn't need to be in there. Maybe the music was a Rorschach blot test gone awry. It sure looked different when I was done. Something like a Jackson Pollock painting, only just in white. But now I could play the song... kind of. And we performed it nicely. Just don't ask me to play it again. I keep my bedroom door closed, and the bathroom door, and Trent's office door, and the door at the bottom of the stairs. All closed. With child-proof doorknob covers. There are lots of places I'd rather my little ones not go. It's hard enough to keep track of them when we are in the same room! As a result, my room stays clean, but stuffy. I open my bedroom door when the babies take their nap, or when they go to bed at night. Yesterday, I went in my room during nap time and found... a mess. I did get a picture of the mess before I blew my stack, but now they've gotten a hold of my camera and lost it. Bad words. I had just purchased a few little baby plants, something like these. My sweet, adorable, pinch-your-cheeks babies were playing in my new plants. They had dumped dirt all over the dresser, the windowsill, the floor, and themselves. Georgie had dirt in his hair. Freddie was fingerpainting in the dirt on the ottoman. The pots were empty, and one poor little plant was being happily waved about, its poor roots bare and exposed. 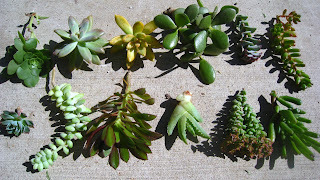 I put the babies back to bed, scooped up the bedraggled plants and hastily re-potted them. Then I wiped and vacuumed. Now I'm hoping they survive. I guess my little tykes can get out of their room during nap time now. <sigh> Keep those doors closed, Mama! I wasn't planning on posting yesterday because we were supposed to be out of town. We were leaving very early in the morning, driving for a few hours, and going to Great-Grandma Ruby's funeral. The boys were excited about going on a road trip. It is Spring Break, after all. To be fair, they were less than excited about the funeral part , but the rest of the trip could be fun. We had our Costco muffins ready for our traditional on-the-road breakfast. We had our clothes ready to go. We had a list of games and activities to keep the little ones busy. All the plans were made. We went to the library to stock up on books - and noticed a puddle under the van. Something was leaking. I didn't mention that I was planning to make this trip without Trent. That is noteworthy in that, if I were stranded, I would be on my own, without my live-in mechanic, with a passel of little children, on a day that was supposed to get up to about 80 degrees. Oh, and the air-conditioning is broken. I was looking forward to seeing family at the funeral, but we scrapped the trip. It just didn't feel safe. In the end, I'm glad we did. Not only was our van sick, but I got sick yesterday too. It would have been miserable. I'm feeling better now, but the van isn't. Poor van. Those nice earmuffs actually live on a hook in the kitchen now. Whew. We have attractive ankles in this family. I know, because I see them on a regular basis. All the boys like to wear the low- or no-show socks. Hello, ankles! We also have an apparent aversion to wearing long pants. They must feel too restrictive, or something. We had to institute a rule that no shorts could be worn when the temperature was below freezing. Ben sprints up the starts on a start winter morning, heads straight to the outdoor thermometer on the back door, cheers if it is 35 degrees, and dons his shorts. Between the shorts and the low socks lie the ankles. Hey, good looking! Oh, and the pants are so often too short. More ankles. These boys grow like a bunch of tipsy dandelions who got into the Miracle Gro. Why do I not notice their lovely ankles until we are at church? Last week, David's choice of white socks to wear between his dark pants and black shoes didn't help to camouflage the ankle situation. Eddie just brought me a crop of nice jeans that had somehow shrunk. We used to call them "floods," or "high waters," thinking they would be useful to wear when splashing so you wouldn't get your clothes very wet. Chris's socks and ankles are getting a bit too much airtime, as well. Here is Ben, just after his recent band performance. How handsome (the ankles). The rest of him is pretty fetching, as well. Too bad these are expensive tuxedo pants ("thuckth-ah-do," for all you Father of the Bride fans) - not something I can run down to the store and just pick up. Come to think of it, I can never run down to the store and just pick up some pants for this tall drink of water. When was the last time you saw a pair of 28x36 pants on the rack? Maybe he's a 30 inch waist now. That would help a tiny bit. Until then, we're ready for the flood. Ben came home from school today at the regular time. It always startles me just a bit that my afternoon is that far gone. Naptime quiet vanishes so quickly around here. Before Ben even came around the corner to where he could see me, he loudly announced, "Mom, I know you are painting again." Busted. I've already painted the finials on the curtain rod, several picture frames, a wall sconce, and the ceiling fan. They all look great. Today it was the fireplace. Perhaps I'm getting carried away. Maybe the fumes are getting to me. But you see, we moved into this house over two years ago. It is 40 years old, and hasn't been updated at all. I'm finally out to change that up a bit. The stonework is massive. It is wide, and goes all the way to the ceiling. It matches the floor in the front entryway. I have to say that stone isn't my favorite material, but it would be suicide to tear it out. I've decided to like it instead. Much easier. 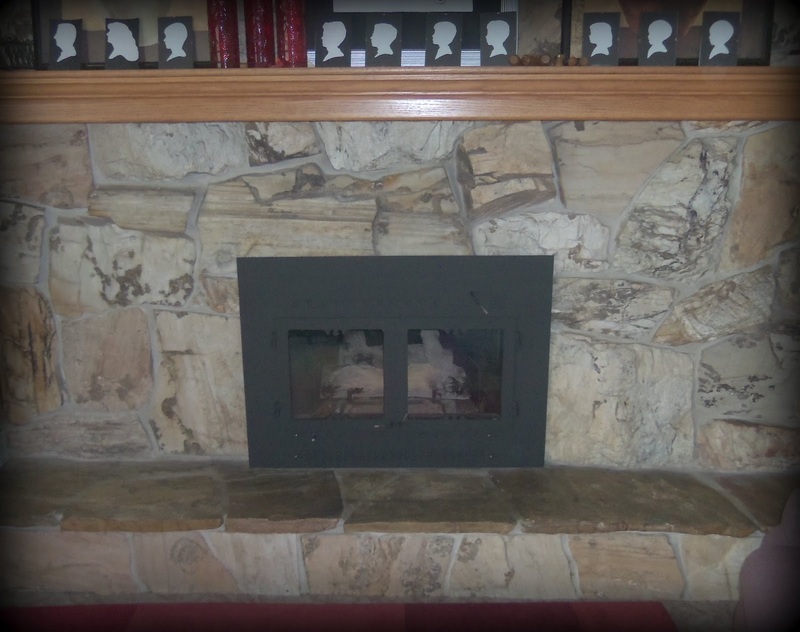 The gas fireplace matches the stone nicely, but I can't quite deal with the gold trim. I thought it would be glossy, but it didn't turn out that way. I'm trying to decide if it is worth repainting. Maybe I'll just learn to like it. It is less interesting to look at, which is what I wanted. 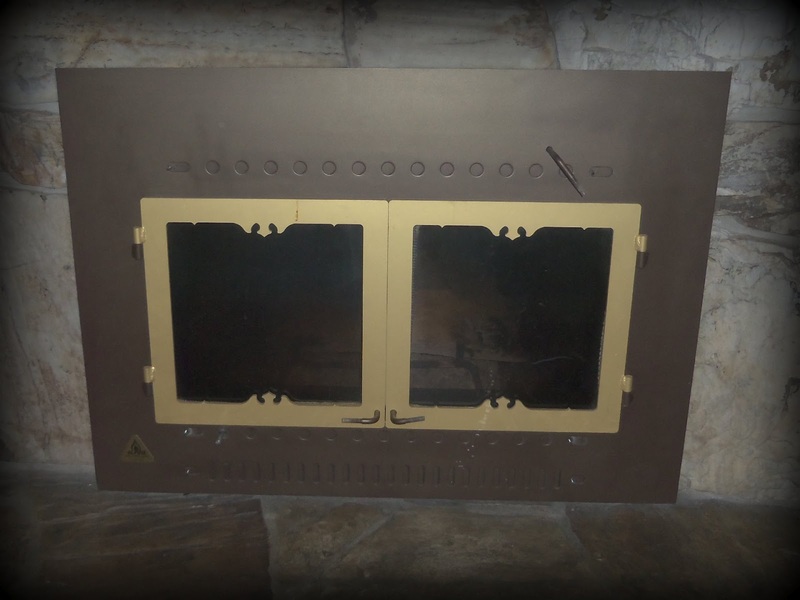 I also painted the fireplace glass with a nice clear coat. See how clear it made the formerly smoky glass? Wouldn't it be nice to have clear paint that actually made things clear? I'd use it on lots of things! How about clean paint - makes things clean? I'd be addicted. More than a dozen years ago, my sister-in-law took me to an enormous European store. We were happily lost for quite a while before finally wandering out, our arms laden with fun doo-dads we hadn't known that we needed. A few years later, we moved nearly a thousand miles, and found ourselves again near lose-yourself-in-happy-shop-ville. Among other necessities I discovered, I purchased four clocks. Like this. I think I actually did hang the clocks up in the boys' room at one point, but then we moved and they got packed. That happens a lot when you move 13 times in 10 years. Since then, the clocks have been separated and hung wherever we needed to know the time - the kitchen, the living room, the bathroom. Since moving into this house (umm... nearly three years ago), they haven't even been hung. They've been resting tiredly on the mantle, drooping against the counter, or languishing in a box. I finally collected all four of them, and decided that it was time to hang them like I'd originally intended. I got out the tape measure and figured out how to space them evenly on the wall. I found four little nails. I even found the trusty old hammer my dad gave me when I went away to college. I climbed up on a chair, ready to make holes in the wall. And dropped the hammer. On my foot. I'm talented that way. Today I have been working on our family room. I took apart our at-least-30-years-old brownish metallic ceiling fan and spray painted it. It takes a few moments to write this, but most of the day to do it. I unscrewed the bulbs and removed the glass shades. I wiped the dust bunny colony off the blades, washed the glass shades, and found a pleasant surprise: they weren't really frosted yellow, but clear glass! The metal parts got a new, shiny coat of silver, and the blades went white. I actually got it put back together before dinner. I made dinner. Yes, with spray paint on my fingers. It was pizza and I didn't make enough (durn growing boys). I washed, folded, and put away a load of towels. I washed a load of jeans and gently dumped them in the middle of the floor because they look nice there. I drove carpool to the school in the morning and in the afternoon, and went back again later because David had to stay after school (too many missed math assignments, I think. Must have mother-talk with him.). I listened to Alec tell me about how he asked a girl out to Prom (filled her locker with chocolate kisses. She opens her locker, they all spill out, and she finds a note to the tune of "now that I've kissed the ground you walk on, would you accompany me to Prom?" I also gave him a shoulder massage. He loves me now. I did my Pilates workout. I didn't complain too much. I visited with my amazing mother. I babysat two of my adorable nieces. I let the big boys watch Psych (their favorite show), and the little ones watch Green Eggs and Ham. I acquired a gallon of "oops" paint in a lovely minty-sagey green color - just perfect for my bedroom (thanks, Erica!). I did the dishes. I made sure two scouts got to their meetings on time. I held and loved on my babies. But I didn't pay the bills, or get to the grocery store. Good thing there is a tomorrow! No, there is no cross-dressing going on in our home. Only the women (and that's just me!) wear make-up around here. Make-up is so ubiquitous that we sometimes don't even notice it. And then again, sometimes we do. Trent was waiting in the line at a fast food joint. He, the boys, and some of my brothers had gone to get an ice cream together. When he returned home, he was telling me (while letting me finish his yummy Oreo shake) about the cashier. "She was watching the couple at the front of the line argue about what they were going to order. Her head stayed still, her expression never changed, but her eyes darted back and forth from one argue-er to the other, like she was watching a very boring tennis match." Trent went on, "But the thing that made it all perfect were her eyes. 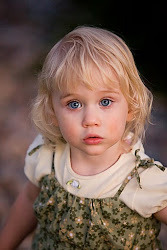 She had on very dark eye make-up, which exaggerated her bored look. You know, the black..." he paused, searching for the word, his expressive hands drawing circles over his eyes, "...highlighter." Yes, I do know. And it's called eyeliner. And thanks for sharing your shake! Angel was complaining about an early morning bout of congestion. She said, "I can't breathe wif mine nose because it is all stuck up." I was looking through my photos and found some that took my breath away. Alaska always does that to me. Trent and I had the fortunate/unfortunate opportunity to go to Alaska last year. Unfortunate because the occasion was a funeral - a sad "see you later" to a great man. Fortunate because we got to go on a trip together (with our nursing babies, but without the other kidlets), and also because, come on, this is ALASKA! It was a wonderful, whirlwind trip. I was not anticipating how tired I would be, travelling four thousand miles and taking two red-eye flights - with two babies - within a week. I was also not anticipating that Trent would fall so head-over-heels in love with Valdez. We've even checked out houses for sale - all four of them. :-) But that's not what I wanted to post about. - Comfortable bed. Not just the old one that we haven't thrown out yet. And nice, sweet-smelling sheets. And plenty of blankets and pillows. - Alarm clock. And perhaps a small pitcher of water to drink on the nightstand, a lamp, notepad and pen, and a garbage can. - Toiletries. Fluffy towels, shampoo, conditioner, razor, soap, lotion, hair dryer, hair spray, nail clippers and all the things you can't take on the plane anymore. - Local events. Brochures and ideas of things to see and do in the area. I'd like to be better about taking my guests out to entertain them than just expect them to fit into my schedule. - Pretty room. Bed nicely made, room decorated well. I want them to feel loved and pampered, not like they are in the way. - Quiet. Sometimes we all need a little bit of downtime or privacy, especially when travelling. - Good food. Yummy and heartwarming as well as tummy-filling - served with a smile and cheerful company. - Think ahead. I'd rather be over-prepared than leave my guests shivering with a thin "let me know if you need anything." We just figured out how many thousands of dollars it will take to take the whole family back to visit Valdez. Aack! I think we'll just have to roll out the welcome mat and hope some of those good people will come to our place. I'll go fluff the towels and try out a new breakfast casserole.